From ancient times to the modern day, appreciating women’s bodies is part of human culture, just like appreciating music is part of our culture. The photos in the 2019 Accordion Babes Calendar combine a timeless 1940’s pin-up aesthetic with modern photography, appreciating women and accordions in a way that’s sensuous, fun, and inspiring. 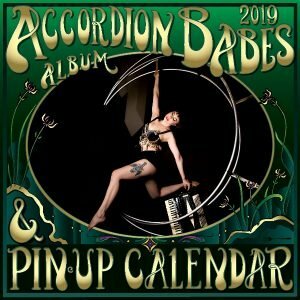 On the 2019 Accordion Babes CD, each Babe has shared one of her songs on an album that’s eclectic, passionate, and wildly alive.